Ray Atkinson- Thank you again for all your help with the last minute gun change and all the arrangements. I nearly canceled this hunt due to what was going on on AR. I had never met Pierre or Ray and only talked on the phone to them. I decided that possibly this was just a problem between them and the client so with some concerns I decided to continue on and see what happened. Boy am I glad I did not cancel because the hunting experience I recieved was without compare. The camp and staff are first rate and well above what I expected. My every need was taken care of both in camp and while hunting. 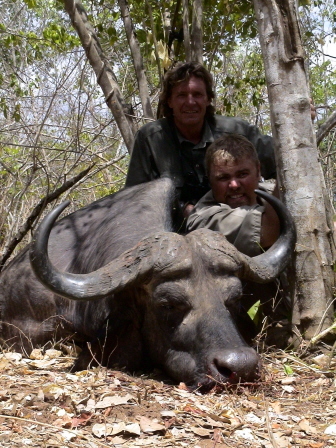 The hunting was non stop and because of this I was too busy to write in a diary. I tried but I only managed for 3 days. I did however keep track of the animals seen as best as I could. The greatest thing to me was how Peiree and Annali took care of their staff. This was apparent to me in that fact that all of the staff would always welcome me with a big smile and welcomed me, whether it was at the kitchen, skin shed out in their kitchen or at the river or just in camp. 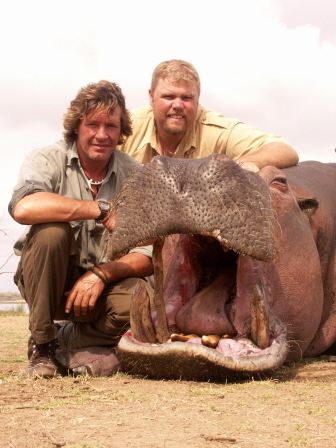 When we were hunting the guys would bust their buts to not only find animals but to get us in position to shoot them. Elephant-saw over 90 animals with 3 bulls very close to 170 cm but just not quite enough. Hippo- too many to count. had to sneak around one sleeping in the bush while we were hunting Buff. Leopard- 3 baits hit not including 2 Leopards in camp 1 of which I shot. Zebra- saw every day including one group that had 35 in it. Went out to hunt and although we did not shoot anything we saw 2 sable bulls but they were too small, Kudu cow and calf and young bull, a reed buck with 1 horn warthogs and elephant. The 1 elephant looked like he had good tusks so off we went at 1:30. Now I would like to mention that at this point I was suffering from the heat pretty good. When I left Canada it was only 4 C (~39 F). I was getting used to the cold. 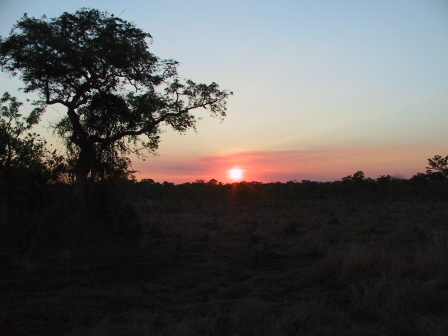 The temperature in the Selous is about 38 C and I am wilting, but off we went. After about 2 kms we got close to the bulls and after about 10 mins Pierre was able to get a good look at him and decided that he was to small. I was glad because the heat was almost unbearable for me. We went back to the truck and continued down to where there was some shade and had lunch and waited for the heat to subside. Continued on at 3pm and came upon a reedbuck. Off we went and just about stepped on him when he jumped up. Pierre said not to shoot as he had only 1 horn. On day 2 shot at 250 m with Barnes X, frontal chest shot, exited exhaust port of animal. Second shot to finish job. Day three in am. We were in the area where we had seen the Kudu the on day 1 when this little guy decided to appear. All I could see was his neck where it joined the shoulders, but that was enough. On way back to camp with the reed buck we saw this warthog. Pierre told me he had one tusk broke off but if I wanted too I could shoot it. 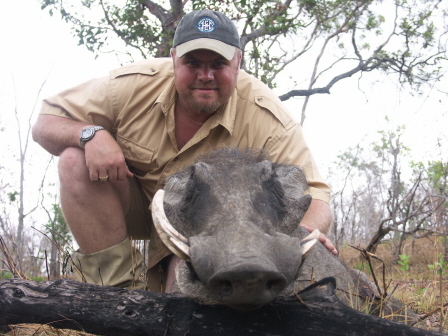 I was looking at the warthog through my scope and Pierre started to say it again thinking that I had not heard him when I shot. He then asked me if I had heard him and I said yes and figured I had better shoot before the warthog heard him as well. The skinners had left the front shoulder from the hartebeest on a tree by their work area. That night a leopard came in to feed on the meat. The skinners chased him away when they got up in the morning. 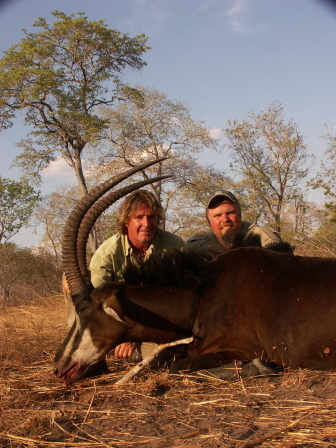 We went out on day 3 and shot a reedbuck and a warthog. 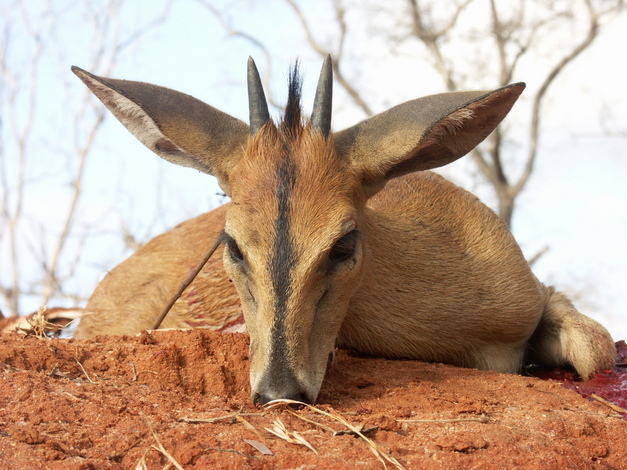 We hung the warthog in the tree and replaced the hartebeest with the front shoulders of the reedbuck. We set up a blind in the skin shed and we decided to come into it at 3 am. Pierre told all the staff the plan and told them to stay in their tents in the AM. We would call them when they could come out. Well of course I could not sleep. 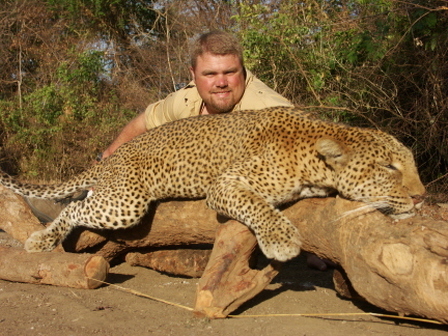 I was up at midnight and at 2 AM I could hear the leopard feeding. I went a woke Pierre and we went to the dining area and had a couple of cigarettes. At 3 am we then went to the skin shed. I could hear the leopard their and I stopped Pierre and said I could hear him. We continued on and we heard the leopard run off into the bush. We got set up in the skin shed and waited. About 4:30 the leopard came back and walked around the skin shed then he went to the bait and started to feed again. We sat and waited and I thought for sure that he would run away as soon as daylight came but he was too hungry and fed on the meat and we waited until we could see him in the morning light. Pierre whispered in my ear to wait until he was broadside and shoot him in the shoulder. Like a nice kitty he stopped for a minute and sat broadside. I shot and he bolted, but only managed to go about 40 ft before he was done. Twiga was out of his tent and ready to go looking for him before we had even got to where I shot him. 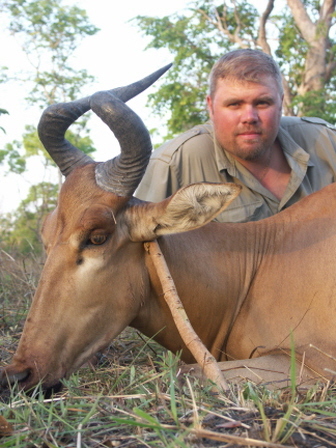 Went out a little later in morning and found this fellow with a hartebeest. Side shot through both lungs and he ran about 50 m more and died. He has no scars or shadows and both ears are complete. The only marks on him are the entrance wound and nice little X exit. We got a call from another camp in a block adjacent (R4) to our area (R2) that Pierre had gotten permission to hunt in ( guys from R4 block had come over to Pierre's block to hunt hunt buffalo with his permission since thy had none there, they had also borrowed a vehicle from him for a few days when theirs had broke down) that had some lions in camp so we decided to take the zebra and use it as bait. We drove in the midday to there and saw that they were not kidding. About 200 m from camp we came across the Lion tracks and followed them another 100 m to where they had been sleeping. 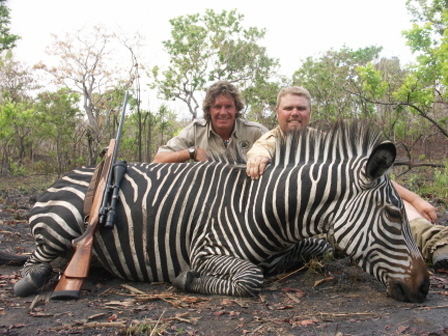 We decided to put up the zebra there in the late afternoon and then check it in the am on our way to go after hippo. Went in the am by foot to check and see if the Lions had come to the bait yet. They had not so we called for the car and continued on to the far river. As we approached the river I could not believe how many hippos were in the water. It seemed everywhere I looked there was Hippo. Pierre glassed and found one that was quite big and we moved down to see if we could get a shot. I asked Pierre if he would back me up because I was worried with possibly wounding him and loosing him amongst so many others. We snuck down to a log along the side of the river and he came out of the water on a sandbank to have a look at us. I and Pierre shot and dropped him with a side on brain shot. My bullet went in the right eye and Pierres went the right ear. Annali was able to get a video of the whole thing and it sounds like just one shot. We used the Hippo for 4 baits and came back the next day to see what was left of him. To my utter shock he was completely gone. We went to the spot and saw how a croc had dragged him away. Pierre looked around and asked me if I would like to shoot a really nice croc and I declined. We stayed there another 2 days but the lions never came into our baits. We did see two young males who had killed a porcupine but they were maybe 2 years old and had not started to grow manes. A leopard came to one of the hippo baits but we decided to leave and head back to Pierre's area and they would contact us if any action started to happen on the baits. On day 2 I managed to wound a buffalo and after tracking him for 4 hrs the blood trail dried up and we were not able to recover him. Pierre decide when we got back from the Lions that we would go after another buffalo. We started out at 6 am and came across some tracks and dung that was still steaming. We got off the truck and I managed to roll my ankle, but there was no way I was going to sit this one out so off we went and about 2 kms later we caught up with the herd, as soon as I saw the buffalo I couldn't even feel the ankle hurting. We got in amongst them in the heavy brush and set up for them to come and see if a bull would come along. After about 20 animals walking past our little opening Pierre whispered to me that there was a good bull come along. I lined up and waited for him to come into my shooting lane. As he came along Pierre said he was a good one. I waited for his chest to appear and then shot. All hell then broke loose. there was buffalo in front of us and behind us and beside us, but they were all headed away from us. Thank god! We went up to where I had shot and look for blood. Nothing, not a bloody thing. Pierre looked at me and asked where I had shot. He scratched his head and laughed at me and said he couldn't believe that I could miss from 20 m. But I had!! He said in jest that from now on he would only allow me to shoot at animals out beyond 200 m because I never missed at that distance. We continued on working the herd for about another 1 km when we found a little patch of blood. We continued for another 3 kms and got a shot at another buffalo. I asked Pierre to shot as well because I did not want to lose my final chance at one. We didn't have time for sticks so offhanded I looked through the scope and all I could see was a big tree between me and the bulls shoulder. I told Pierre and we moved to our left a step. We shot and ran up to where him and the bull tried to get up but i put another one in him and he was done. We looked around and looked at the bull. He had 3 shots in him. One in the back of the front leg, one in the front of the leg. and my finishing shot. We looked around and found that my first shot which was a solid had gone through the tree for about a foot, then through him and exited. Not bad for a 416. Pierre's bullet we found in under the skin on the off side. As we were leaving camp(100 m) a few days later we came across this fine buck. 1 shot and we were back having coffee by 06:30. 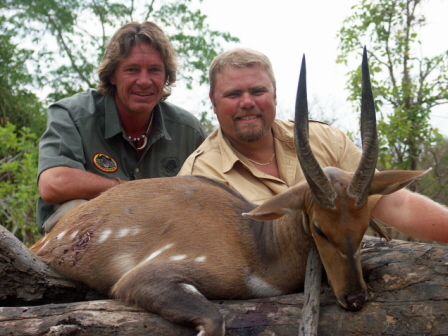 At breakfast I had asked Pierre what was some of the more difficult animals to get and he said that bush buck was hard because there were not a lot of them. At camp after the Bush buck I again asked him what was the hardest animal. 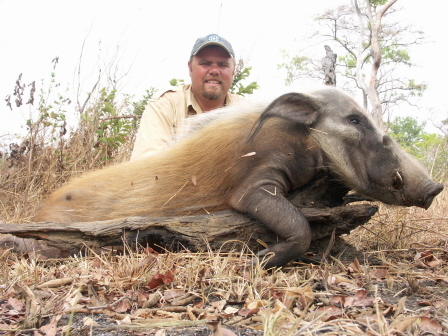 He said that he had not had a client shoot a bush pig in 5 years. Out we went and at at 08:30 what should appear not 1 but 2 bush pigs. Pierre said to take the one on the right if he came from behind the trees. Just then he stepped out and looked straight at me. I shot him in the brain and the bullet exited out the one ham of the pig. We were back in camp at 09:30 and when we told Annali that we had a bush pig she remarked that we were just talking about it. We saw this bull with a group of cows one day and stalked him for several hours/kms but could never get a shot at him. The final insult was when he went over a small rise and walked back and fourth where we could only see his horns. Then finally the wind changed and they were gone. Three days later we came to a waterhole near where we had seen him and there he and his girls were. The wind was blowing directly from him to us and the sun was setting to our backs. Perfect. We snuck to about 150 m and I shot. Down he went. Up he got. Pierre said give him another. Bang. Down he went. Up he came again. Pierre said to shoot him again. I said this is my last bullet because I forgot my others at the truck. So I shot again. He started to try and get away but was in real trouble. Twiga and Dominic yelled as they went running by us that they would catch him! They caught him as he was going down for the last time. All three bullets had hit him good. The first one entered at the back of the ribs and out through the front left shoulder. The second one went through the neck. The third one went through both shoulders. Boy are these sable tough! 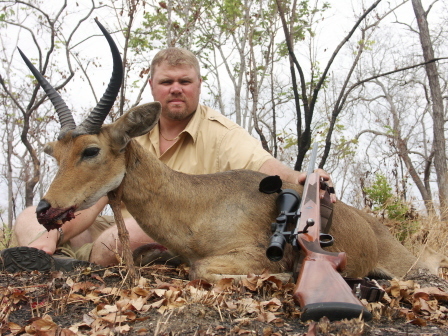 I decided finally on day 20 to shoot a duiker if possible. This little fellow decided to grant me my wish. I could have shot several others but decide not to for one reason or another. I think that the best way that I can answer the questions of whether I felt this hunt was worth it or not is simply to state that I have already put a deposit on a 2007 21 Day hunt. I had the time of my life and the pictures and trophies to prove it. Pierre, Annali and Ray Atkinsion have made this a great experience and I have no reservations about recommending them or the areas that they hunt. I was sad to leave but I shall return!